Lisa and Eric Chamberlain say their immersion in all things anatomy-related was like going to medical school. It’s called the ‘bullet-time effect,’ a term that has come to describe a filming technique that goes way, way beyond simple slow motion. Perhaps the best-known example of this effect are the sequences in the movie The Matrix, where, for example, the character played by Keanu Reeves leaps in the air and appears to suspend there while the point of view rotates 360 degrees around him to reveal a series of improbable, hyper-slow-motion activities, such as bullets flying at and past him. Eric and Lisa Chamberlain were part of the team that designed the camera system for those sequences, and, as it turned out, this was to be their last real work in Hollywood special effects. Indeed, by that time (1998), their talents with model making — on display in several other movies, including Judge Dredd, Eraser, and Starship Troopers — had caught the attention of someone in a completely different field: the making of physical models (body parts) for medical training. That individual, Mark Curtis, a subcontractor who did staff training for medical-device makers, eventually gave the Chamberlains a few projects, such as one to build a human leg on which individuals could practice saphenous vein dissection. Before long, the two were hooked. And soon, they saw this emerging industry as a way to trade the erratic lifestyle of a special-effects artist — “it’s OK if you’re willing to live like a gypsy,” said Lisa, noting an inconsistency in work and thus cash flow — for something more potentially stable. Meanwhile, it was also as a way to remain in the Berkshires, a region they had come to love. 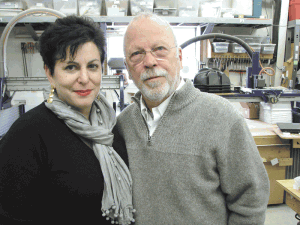 Fast-forwarding through the ensuing 12 years — and a steep learning curve on the broad subject of anatomy (more on that later) — the Chamberlain Group, the company formed by the couple, has become an industry leader in physical model making. Its customers include medical-device makers such as Johnson & Johnson, Boston Scientific, and Intuitive Surgical, as well as medical care providers ranging from Johns Hopkins to the Lahey Clinic to Baystate Medical Center. The company currently does business in 48 states and 50 countries, supplying customers with everything from entire hearts (some that beat) to a synthetic bowl product, called Tactility, developed in collaboration with Baystate for use in the training of residents. And when asked how this success was accomplished, both Eric and Lisa Chamberlain went back to their days with The Matrix and several Arnold Schwarzenegger movies to help find answers. This open-mindedness, coupled with film work involving three dimensions, has transferred nicely to the making of body parts, said Eric, noting that the team at Chamberlain Group, like special-effects artists, are, in a nutshell, problem solvers and solution finders. Lisa Chamberlain did not disclose sales figures, but growth for the Chamberlain Group has been steady, and the outlook is positive, despite predictions made years ago that the medical field would, like aerospace, come to rely on computer simulation for much if not all of its training. For this issue, BusinessWest takes a look at what goes on inside the Chamberlain Group facilities in Great Barrington, and why the company’s operating slogan, “Bringing Practice to the Practice of Medicine,” has become a formula for success. There’s a framed copy of the poster from the first Ghostbusters movie hanging on a wall just off the front lobby of the company’s headquarters. It’s one of many mementos from the days when the Chamberlains were working for R/Greenberg Associates in New York, where they met. Eric was head of physical effects for the production company, specializing in miniature models, mechanical effects, and motion controls, while working on pictures ranging from Ghostbusters to Tootsie, while Lisa worked more on the promotions end, working on posters (like the one on the wall), trailers, and other forms of advertising. Seeking to get away from the bustle of Gotham, the Chamberlains and others at R/Greenberg headed for the Berkshires to join a budding special-effects house called Mass Illusion, where they created a memorable explosion scene in Eraser, among many other credits. By 1997, however, a number of circumstances were colliding to bring the couple into the medical field. Mass Illusion was in the process of migrating to the West Coast, Mark Curtis was starting to feed projects to the freelance model makers, and the Chamberlains were looking for more stability in their careers. At first, they had no idea of what they were getting into with medical models, understanding only that it was work — which they needed. “We said, ‘sure, what’s that?’” noted Lisa, when recalling Curtis’s initial inquiries. “We were like all good freelancers — you take the work first and figure it out after. Near the end of 1998, the two had made up their minds to take their careers in this new direction — and they took several Mass Illusion artists along for the ride. But first, they had to learn anatomy. Actually, they learned it as they went, burying their noses in Gray’s Anatomy and other 3-inch-thick volumes, while also asking myriad questions of physicians and even attending several surgical procedures to observe first-hand how and why physicians do what they do. Lisa agreed. “There was a huge amount of learning,” said the college English major, who can now recite the names of hundreds of surgical procedures or the corresponding acronyms. “We learned a procedure, an anatomical sequence at a time, and we always tell our clients, ‘teach us as if you were teaching a resident or a physician about your new device. 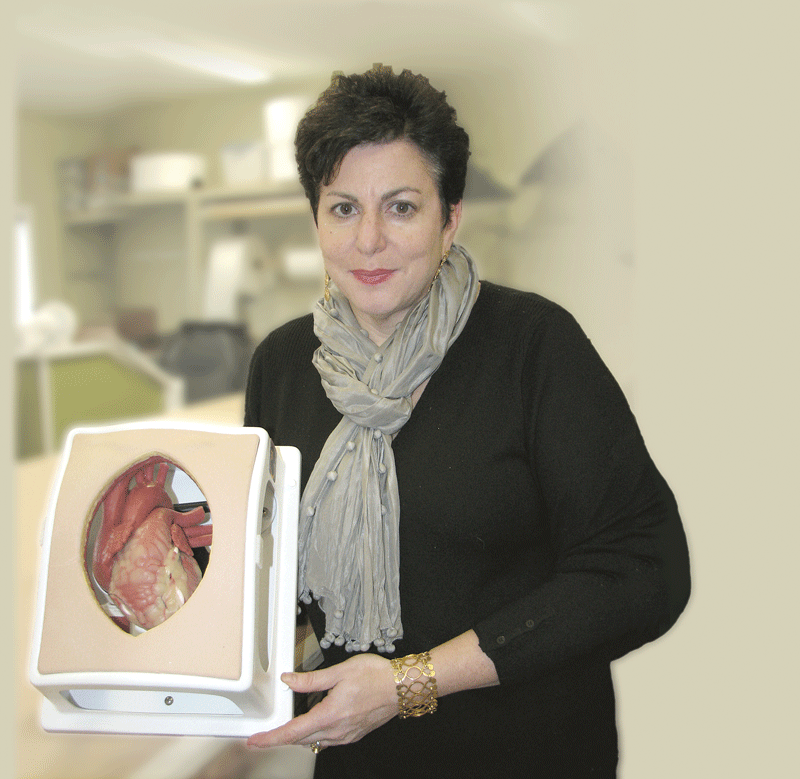 Lisa Chamberlain, seen here with one of the many heart models made by the company, says a “propensity for invention” has helped drive consistent growth. 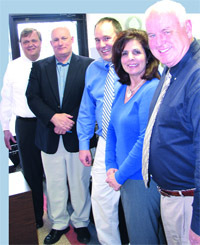 They’ve heard that phrase, or words to that effect, many times over the years, as they’ve introduced new products and added new lines to the client list, a process that gained some serious momentum after the Chamberlains attended a medical-device convention for the Society of Thoracic Surgeons in Fort Lauderdale in the winter of 2000. The basic operating strategy, she continued, is to “wait for the phone to ring” with requests from medical-device makers and health care providers for specific (and sometimes very specific) training aids. 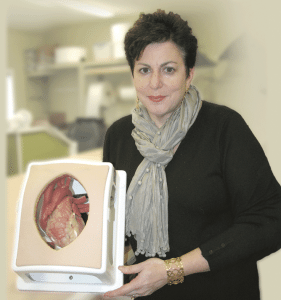 Such was the case with Baystate and Tactility, she explained, noting that the product, developed in conjunction with Baystate with the help of a $150,000 grant from the John Adams Innovation Institute, represents a significant improvement over the pig intestine that had been used in resident training. There is no catalog, per se, although several products are listed on the Web site, said Chamberlain, because the company believes it serves its customers better by engaging them in what they desire to purchase. 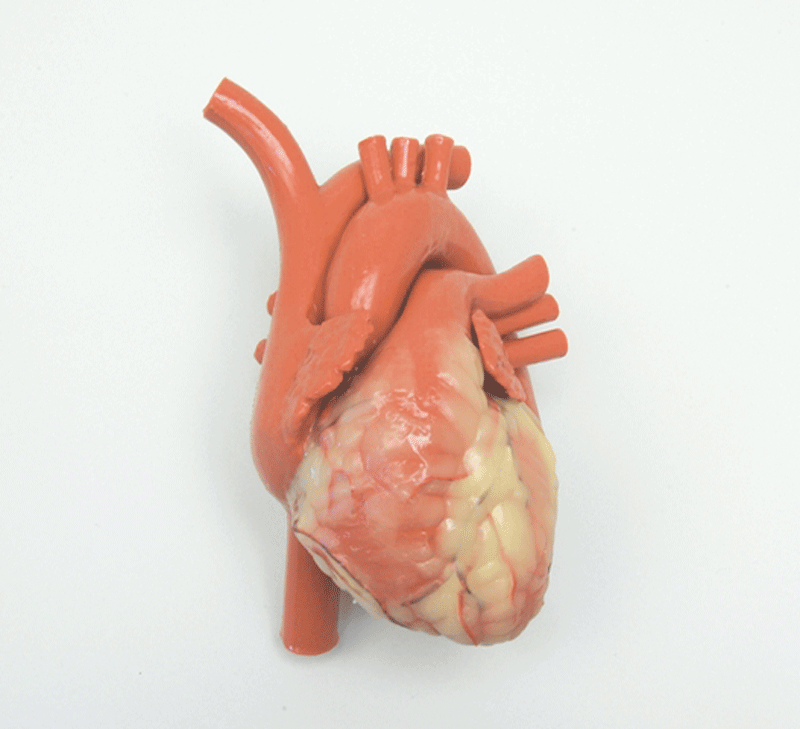 The company produces perhaps 100 different models of the heart, she continued, all with some standard equipment, but with variations on the theme depending on the intended subject matter for training. When it comes to making trainers for medical-device makers, said Lisa, the company usually starts with a prototype sent by the manufacturer with the purpose of familiarizing Chamberlain Group artisans with the device’s use and “tissue interaction,” which she called a critical part of the learning process when it comes to manufacturing useful tissues that behave like the real thing. This is part of what she called a “knowledge-extraction process” the company goes through with clients, and while discussing it, she again drew comparisons to movie special-effects work, and specifically those aspects of creating things from scratch — and working tirelessly to create a solution. One of company’s early clients (and still a steady customer) is Intuitive Surgical, maker of the da Vinci surgical robot, said Lisa, noting that, about a decade ago, the Chamberlain Group developed something called the ‘robotic trainer kit,’ a simple skills kit that has enabled the company’s products to reach markets around the world, and remains one of its best-selling items. As he talked about how the company’s products are taken from a phone call to conception to the training facility, Eric Chamberlain, who handles the design and development aspects of the business, stared at his computer, equipped with 3-D design software. There, he demonstrated for BusinessWest how a model begins to take shape digitally, with scanned images from CT scans or MRIs. And he used, as an example, actual patient data, specifically an individual with an abdominal aortic aneurism, or AAA, as it’s known in medical circles, for use in creation of a kit to train people in how to treat that condition. As he deftly manipulated his mouse, Chamberlain was able to isolate the bulging aorta and create a 3-D view of it. This piece can then be exported, he explained, and the company can make a mold for it, machine it with milling equipment, or 3-D print it using state-of-the-art technology that uses thousands of thin layers of powder which adhere together. Using these processes, the company has created the ‘liliac artery approach training model for AAA stenting, with replaceable aorta’ and several hundred other kits involving individual body parts and systems that look and feel like the real thing, and, more importantly, provide invaluable hands-on learning opportunities for those who will use them. And to ensure that the products provide those experiences, the company works closely with its clients — and immerses itself in a learning process — to gain the complete understanding of the anatomy, mechanical interface, and procedure subtleties necessary for the product to fulfill its intended mission — that aforementioned involved interaction. Lisa Chamberlain told BusinessWest there is no five-year plan for this business, primarily because the industry, the technology, and the needs within the medical community are changing at much too rapid a pace for that, as their first 12 years in business have clearly shown. And because this pace of growth is expected to only accelerate as the infant continues to grow, the Chamberlains see a bright future for their venture, in work for both medical-device makers — who will need trainers on which residents and physicians can become proficient with their instruments and robots — and health care facilities that want to train individuals in an environment that is as close to the real thing as possible. Harkening back to the Chamberlains’ special-effects background one more time, she said their experience in that industry revealed to them the limitations of computer graphics, something that fuels optimism about their future in business. Drawing an analogy to the architectural field, she said that, while computer animation is allowing those in the profession to see and understand how a building will look and function long before it’s built, many in that profession still draw by hand on drafting tables. “Traditional apprenticeship-oriented professions, such as architecture, such as medicine, have had an inherent resistant to change,” she explained, adding that this phenomenon — coupled with the rapid pace of innovation in surgical technique and, therefore, the need to continually train physicians and residents — adds up to opportunities for those making physical models. Beyond the Ghostbusters poster, there are few reminders of the Chamberlains’ “other life,” as Lisa called it, creating special effects for Hollywood. On one wall, there’s a map of the world with push pins in every country and state the company has penetrated. Meanwhile, other wall space is devoted to images of anatomy more likely to be found in a physician’s office. But while they’ve left the movie business behind, they’ve taken many important lessons with them, especially that “propensity for invention” that Lisa mentioned. It has served them well, and helped create a model of entrepreneurship and business success — in more than ways than one.